Kisoro Tours Uganda: 5-day Uganda Rwanda Gorillas Tracking Tour/Safari in Volcanoes National Park and Bwindi Impenetrable National Park. 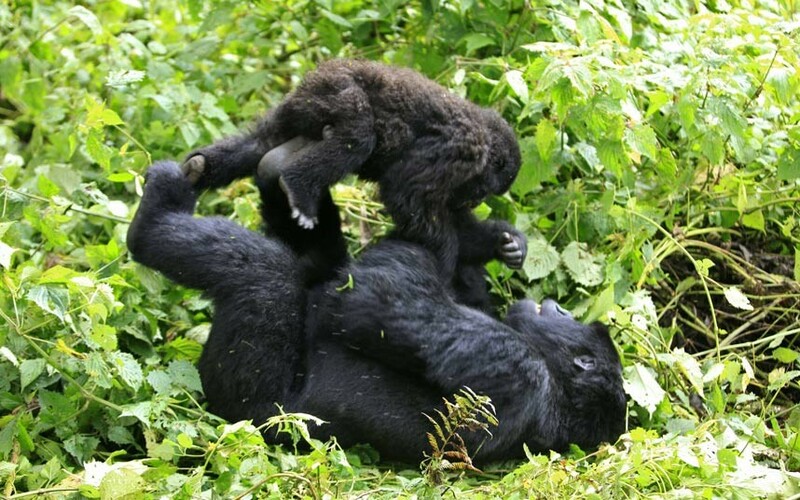 5-day Uganda Rwanda Gorillas Tracking Tour/Safari in Volcanoes National Park and Bwindi Impenetrable National Park. with gorilla treks in Volcanoes National Park and Bwindi Impenetrable National Park. The tour starts in Uganda and ends in Rwanda. You can choose to track golden monkeys instead of doing a second gorilla trek in Rwanda. Our tour guide will meet you at your hotel in Kampala and drive west to Bwindi Impenetrable National Park. Have a journey break at the Equator and take some photos. Then continue to Mbarara town where you will stop for lunch prior to heading through the grasslands of Ankole, Along the road you will enjoy the beauty of the wonderful long horned cattle before going on to the highlands of Kigezi referred to as the 'Switzerland of Africa! You will arrive in Bwindi in the evening; freshen up as you wait for dinner and over night. Take a hearty breakfast after which a ranger then move to the ranger station for briefing from ranger guides who will guide you through the impenetrable forest. Tracking the Gorillas through the thick forest is awe-Inspiring experience, spend 1 hour with them, and be back at the lodge in time for dinner. Remember to carry packed lunch, enough water as this activity is so tiring, it's also important to wear good hiking boots of an ankle level and long trousers for protection against stinging nettles. Take breakfast and depart for Rwanda. You will cross the border via Kisoro or Kabale then clear at the boarder - Rwanda is 1 hour behind Uganda . 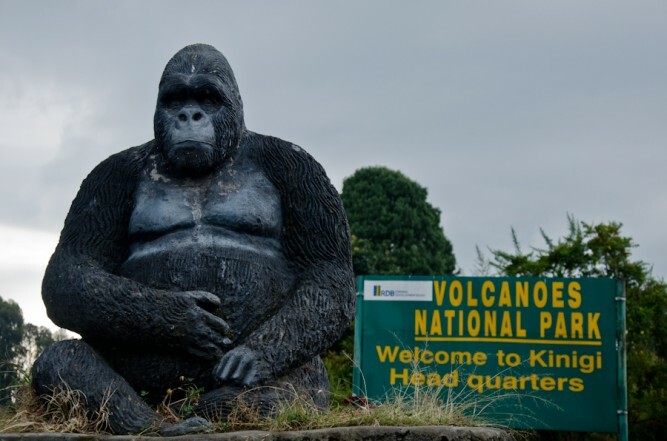 Located in the far northwest of Rwanda, the Parc des Volcans is home to the steep slopes of this wonderful mountain range home of the rare mountain gorilla and the rich mosaic of montane ecosystems, which cuddles evergreen and bamboo forest, open grassland, swamp and heath. Low Budget: Muhabura Hotel or Kinigi Guest House. Have breakfast and go to park head offices for briefing after that set off in the forest for Gorilla trekking. A thrilling trek through the refined foothills of the Virungas provides inspiring views in all directions. Then, suddenly, the trail enters the national park, engrossing trekkers in the strange closeness of the rainforest, alive with the calls of colorful birds and chattering of the rare golden monkey, and besieged with fresh spoor of the mountains' elusive populations of buffalo and elephant. Through gaps in the forest canopy, the marvelous peaks are sighted, easy to get to and among the uppermost in Africa, indicating an ascent. Gorilla trekking is quite strenuous but a worthwhile on encounter of these gentle giants. The enthusiasm of your coming across with these apes will wipe away your intricacy of the strenuous trek. 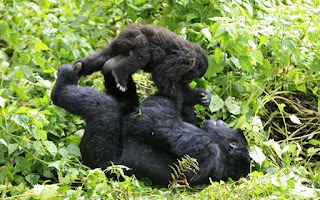 Spend time watching gorillas, watch the adults feeding their young ones, brushing and resting as the youngsters play from vines in a pleasurably playful display. Take early breakfast and drive to Kigali. Lunch en route reaching in the early evening to go to the airport.